Zoekt u van dit model een specifiek type? Scrol dan naar beneden. MC9090-G, Wi-Fi (802.11a/b/g), 1D Laser Scanner, Windows Mobile 6.1, 128MB RAM/128MB ROM, 53 key, Bluetooth. MC9090-Z, UHF RFID, Wi-Fi (802.11a/b/g), Long Range 1D Laser Scanner, Windows Mobile 6.1, 64MB RAM/128MB ROM, 53 key, Bluetooth. MC9090-G, Wireless Gun Terminal: 802.11a/b/g, DPM Imager, Color, 64MB RAM/128MB ROM, 53-keys, Windows Mobile 5.0, Audio/Voice/Bluetooth. MC9090-G, WLAN 802.11a/b/g, lorax long range 1D laser, color touch screen, 64/128MB, 53 VT key, Windows Mobile 6.1, Audio/Voice/Bluetooth. 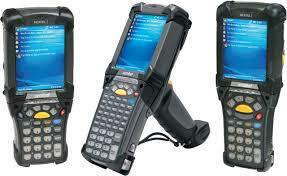 MC9090-Z, UHF RFID, Wi-Fi (802.11a/b/g), 2D Imager, Windows Mobile 6.1, 64MB RAM/128MB ROM, 53 key, Bluetooth.